In this deck corner design for your garden, small raised garden bed areas were set up on either corner of the deck. 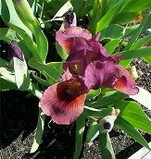 In the spring, the outermost corner sprouts color with an Iris, 'Lady in Red'. 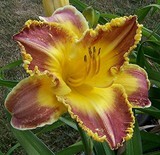 The growing foliage provides greenery while waiting the blooms of the daylilies. Mid-summer, a daylily trio, 'Smuggler's Gold', 'Camel Caravan', and 'Comanche Drums', take over the task of adding color at the edges of the deck.